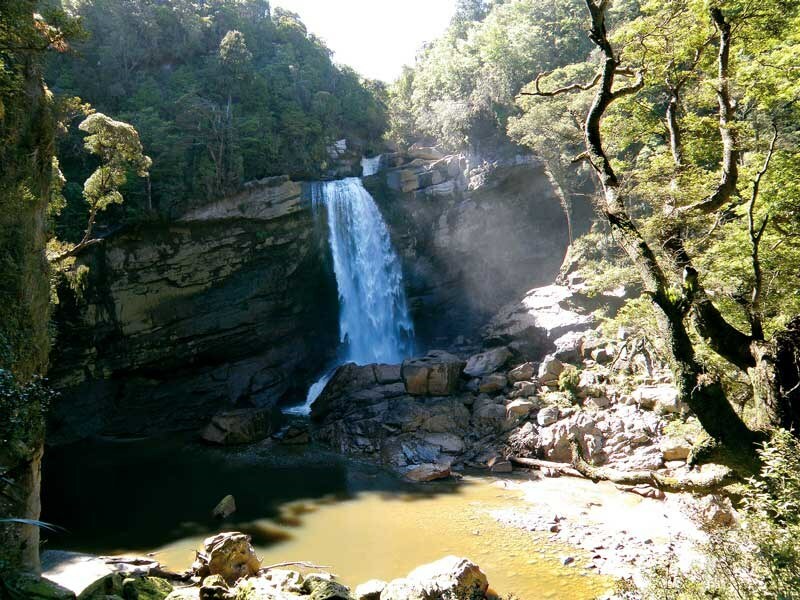 Heather Whelan continues her journey in the South island, this time exploring the wonders of Westport and Karamea. I had always wanted to see the eighth wonder of the world, otherwise known as the Denniston incline, but last time we were in the area we so busy admiring the coastal views that we missed the turn-off. This time, being extra vigilant with the map, we travelled the 25km northeast from Westport and turned inland to search for a ghost town. 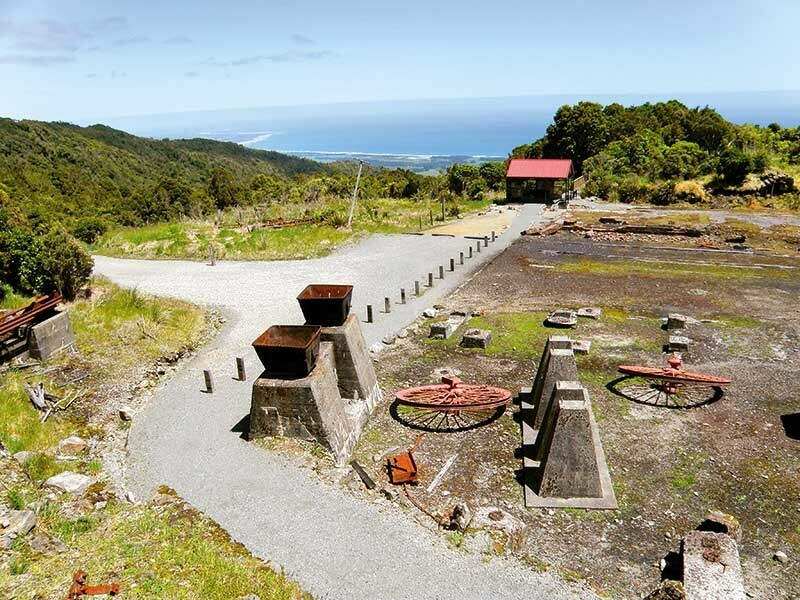 Back in the 19th and early-20th centuries, Denniston was New Zealand’s largest coal mine and a thriving mining community, home to more than 1500 people. Perched above steep cliffs on a windswept and barren plateau, people living in Denniston were extremely isolated. ccess to the settlement was by a very steep and windy track – or in a wagon on the infamous incline itself. The Denniston incline was widely recognised as an amazing feat of engineering. The incline dropped 510 metres from the mining settlement down to Conns Creek below. As we stood and looked over the edge of the incline I understood why many women were just too scared to make another journey down in a wagon, preferring to stay forever on the plateau. The incline was closed in the 1960s and a road was built which made it easy for workers to live on the coast. The mine finally stopped working in 1995. It’s is now a tourist attraction, of course. The stunning views up and down the coast would make the drive up worthwhile even if there were nothing else to see. The Denniston Heritage Trust, the Department of Conservation and the Friends of the Hill Society are working to preserve and protect the area’s unique industrial history. We spent a couple of hours wandering around the ghost town and mine area, marvelling at the hardy nature of those who lived and died on ‘the hill’. 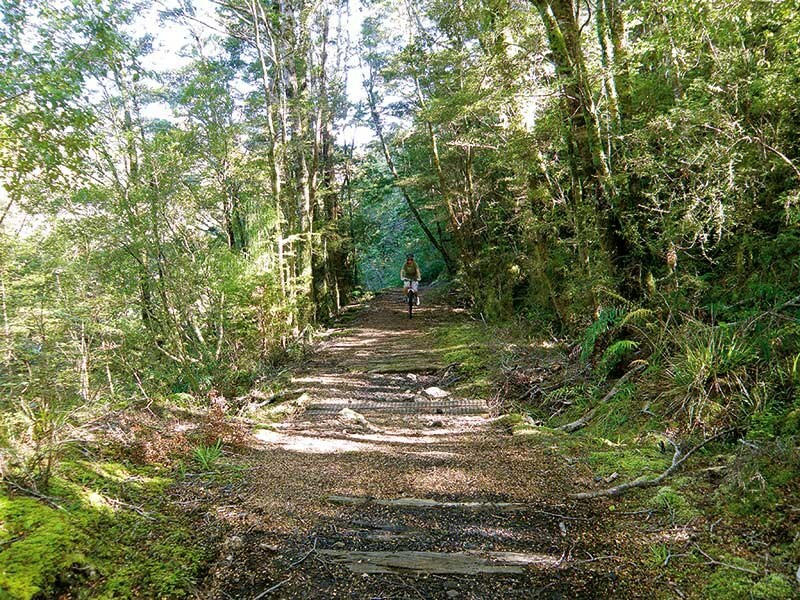 There are several walking tracks at Denniston, including a five hour one that follows the route used by miners, up and down the hill. 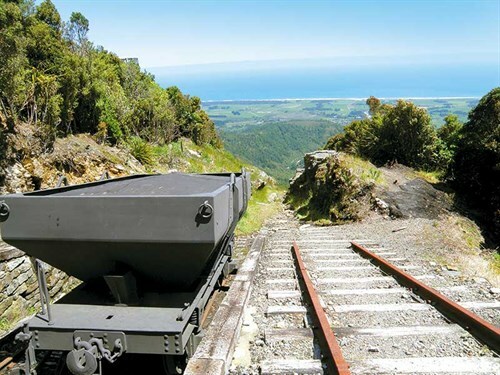 Alternatively you can take the Denniston Experience tour that includes a train trip into the mine. Next on our itinerary was a ramble along the Cape Foulwind walkway. The headland was named Rocky Cape by Abel Tasman when he anchored here in 1642, his first anchorage in New Zealand. An astrolabe, similar to the one he used for navigation is displayed along the cliff-top walk. The return walk takes about three hours across undulating farmland, past the lighthouse and a fur seal colony. We watched the seals for a long time as there were many pups being pushed and pulled by their mothers as they emerged from the sea. The present lighthouse is automated but stands on the site of an earlier wooden, manned one. Luckily the lighthouses have prevented ships being lost in the area, although there was a mystery shipwreck sighted by the early explorers Heaphy and Brunner in 1846. We next pulled up behind another pub. This was at Seddonville, which is about halfway between Westport and the end of the road at Karamea. Seddonville is a quiet hamlet with few properties looking inhabited. The publican, on hearing that we were planning to visit the nearby Charming Creek Walkway, suggested we ride it. Since the track follows the route of an old railway we imagined that it would be like other rail trails we have cycled. Be warned, this walkway still has the sleepers in place for large sections of the track and it is rather bumpy! The walkway passes through native bush, over swing bridges and through old railway tunnels. Remnants of the industrial past lie quietly rusting here and there. Near the stunning Mangatini Falls there had been a slip which required Malcolm to carry the bikes over a tangle of shrubs and mud but it all added to the adventure. The return trip is a five-hour-walk but we cycled it in a leisurely three-and-a-half. 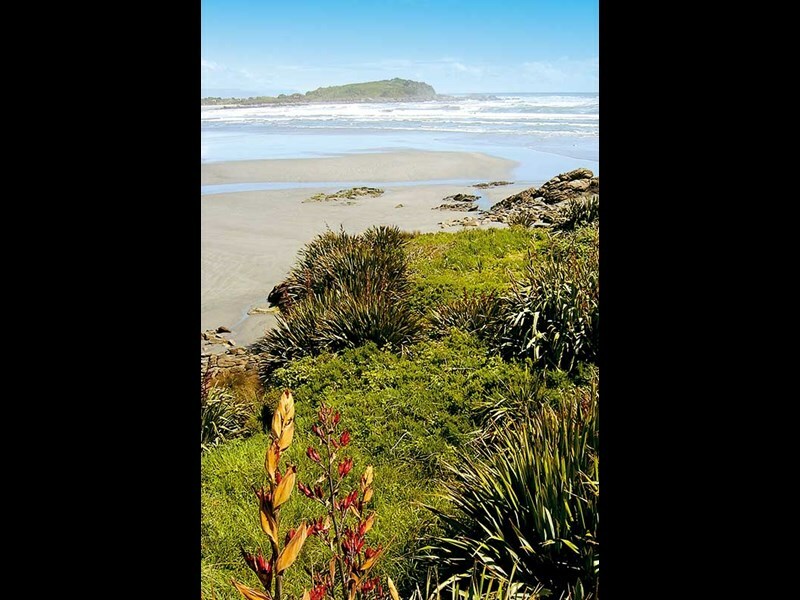 Karamea is a place where visitors could stay for a long time. Although it is well off the beaten track, the settlement has shops, cafes and other facilities. 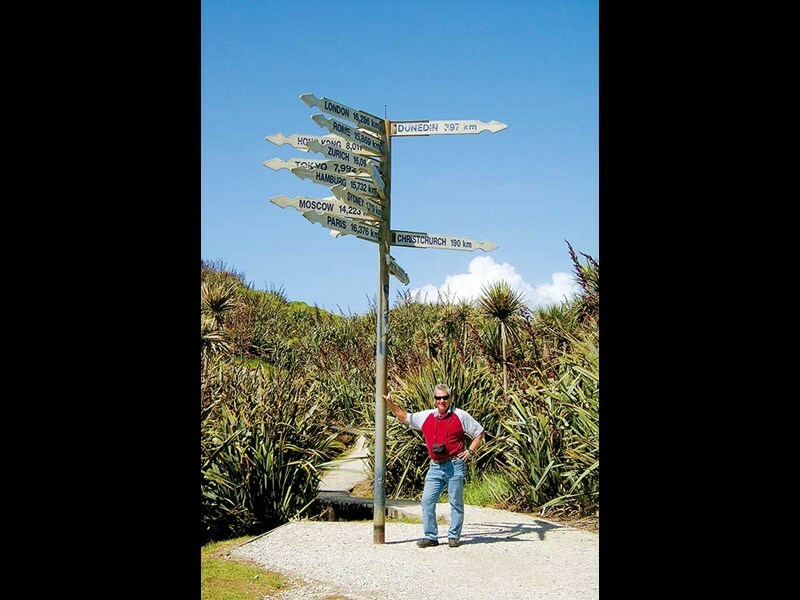 There are walks of all types and lengths in the area, including the start of the multi-day Heaphy track. We freedom camped at the ruined mill on McCallums Mill Road. 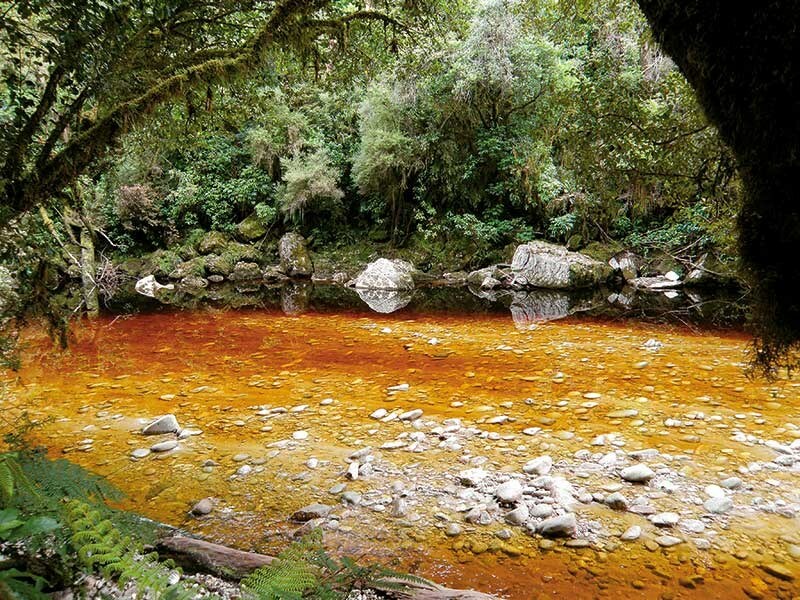 If Karamea seems like the end of the road, the road to the Oparara Basin is beyond the end of the road. The dirt road winds through thick forest and is not suitable for motorhomes. Feeling like the only people left on earth, it was a surprise to emerge into a very large, though empty, carpark after 45 minutes of driving. 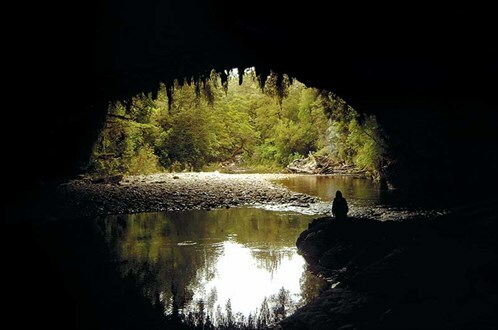 The Oparara Basin is a large area of limestone formations and caves. We visited Moria Gate by way of the Mirror Tarn, one of the many little lakes that have amazing reflective qualities due to the amount of tannin in the water. This walk took about an hour. Next we went to the Oparara Arch, the track winding between moss and lichen covered trees where a variety of birdlife could be seen. We were especially delighted in seeing the South Island robin. Finally, we ventured into two very dark caves: Box Canyon and Crazy Paving. These are home to cave wetas and spiders. Back in Karamea we ate at the wonderfully named Last Resort Cafe before turning the bus south and heading away from an area full of wonders. 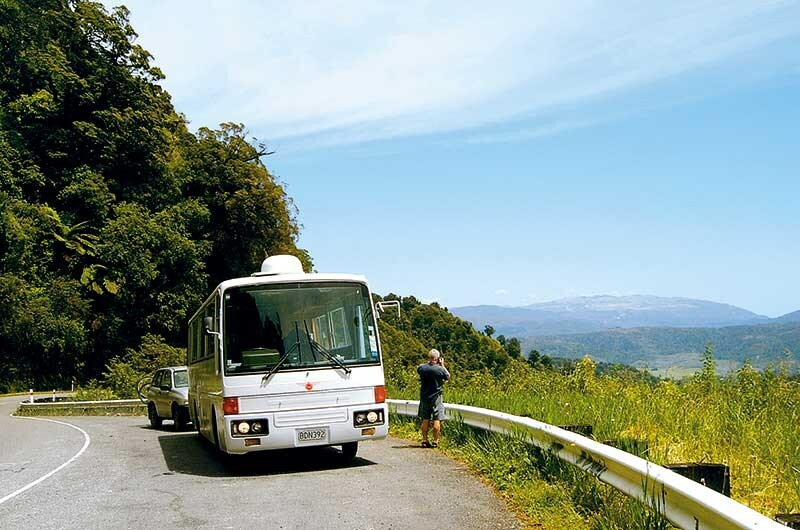 Read the full article in issue #130 of Motorhomes Caravans & Destinations magazine. Subscribe here.